My town has a very special place in my heart. I have been teaching here for about six months already and everyday has been eventful, there is so much to do and see. Trang is perfectly located in the South with countrysides, beaches, waterfalls and caves all of this located close to the center of town. Not only does this beautiful medium-sized town have many adventurous destinations but it also offers beautiful homey coffee shops at every corner as well as their famous “Trang Cake”. The people here in Trang are lovely and LOVE us “farangs”. In low-season not many foreigners are seen only us teachers and during high season many are seen but just around the train staion. My favorite places to eat are the local daily night market, it is in the center of town. Or I have a special older lady who owns a little restaurant on the street and she sells the best Sukinam, fried rice and sweet and sour dishes. I like her so much because her food cannot get more authentic, cheap and centrally located. As for drinking I like many cafes, but my favorite café has got to be Old Town it is fairly new and has the best coffee and pasteries. In Trang I joined a Muay Thai gym so that has defenitaly been my favorite place to exercise as well as the many parks Trang has. In Trang everything is 10 minutes away; however, nothing seems to be walking distance. In Trang I get around with my motorbike. I rent my motorbike from a really nice Thai lady and she charges me 1,950 per month. It is very easy to drive and pretty safe drive here. Even though everything seems very close on my motorbike, walking everywhere would take me forever to get from point A to point B. Trang also offers motor taxis and tuk tuks but these modes of transportation can get expensive if you use them daily. My first month living in Trang I lived in a not so pretty place. The building was actually very haunting and did not have working WIFI nor hot water. After a month of searching and with the help of some Thai friends I was able to find a decent price for a newly built building in town. 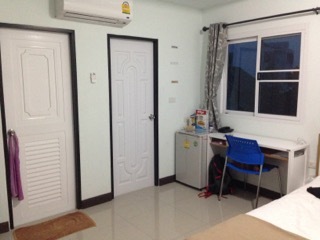 I live across the street from one of the hospitals in Trang, in a basic room with a queen sized bed, desk, closet, balcony and refrigerator. The WIFI is amazing and there is hot water! For this I pay 4,500 a month. Normally after work I either workout, go to the park and run or I will go to Muay Thai. My workout can last from an hour or an hour and a half. The days I do not work out is because I have private tutoring session from 5-6 or 5:30-6:30. After working out or tutoring I will get dinner and then head home to rest. My weekends are all very different. 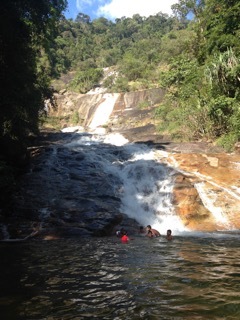 Some weekends I travel to nearby places like Krabi, Ao Nang, waterfalls, caves, the beaches in Trang or nearby islands. Or I will stay here in Trang and get a message, go to a café, go to the pool, go to our weekend train station market or I will just hang out with friends and have a relaxing weekend in town. Even if there is nothing to do, you can always find something to do locally. There are so many nearby excursions you can do from Trang and all of them are amazing in their own way but my favorite day trip I took was the 3 island tour around the Trang islands. This tour took us to Koh Mook, Koh Kradan and Koh Chauk. We first stopped at the Emerald Cave in Koh Mook, then we snorkelled around Koh Mook, then we were taken to Koh Kradan to have lunch and have some time on the beach. 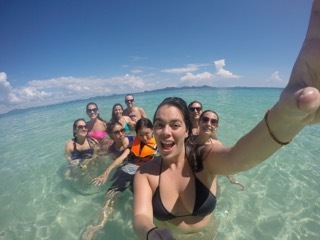 After taking some rest time on the beach we then snorkelled around Krandan, finally we went to Koh Chauk to snorkel. The trip was amazing. The things I saw were just beautiful the water was clear blue and the organization of the tour was simply amazing. I would recommend this trip to everyone! I traveled about every other weekend. Khonburi is fairly quiet on the weekends, but there are things to do. The first Sunday of every month there is a fairly big market in the morning (ends around 1pm). They have everything from household items to clothes to food stands and everything in between (for a cheap price). This market is at a field close to the normal market near the round a bout (you can’t miss it). On the weekends you stay in Khonburi, I also suggest just walking around town because you never know what you will run into. One of my favorite nights here was when I stumbled into a memorial service/party. I was welcomed with open arms. I was given free beer and food, and danced to a live band for hours. All of this happened because I heard music and I walked over to see what it was and immediately was taken in. Some words of advice, at the beginning living in this town will seem difficult because you cannot find anything and people here give the worst directions, not knowing the language can be challenging; however, I promise finding your way around Trang will be easy and no matter how long you live here you will always find a new way to get to places. There are so many ways to get to one place here. Also people are extremely friendly and when you first move here everyone will greet you on the street, be prepared for awkward stares and for people to ask for a “selfie” with you. Last tip whenever you are feeling homesick go to Robinson, it is the closest thing we have that looks and feels like home. 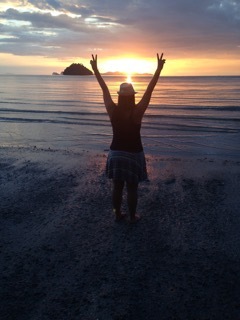 Have fun and enjoy every second of Trang, it is a beautiful city in Thailand with a lot to offer. Now go explore!